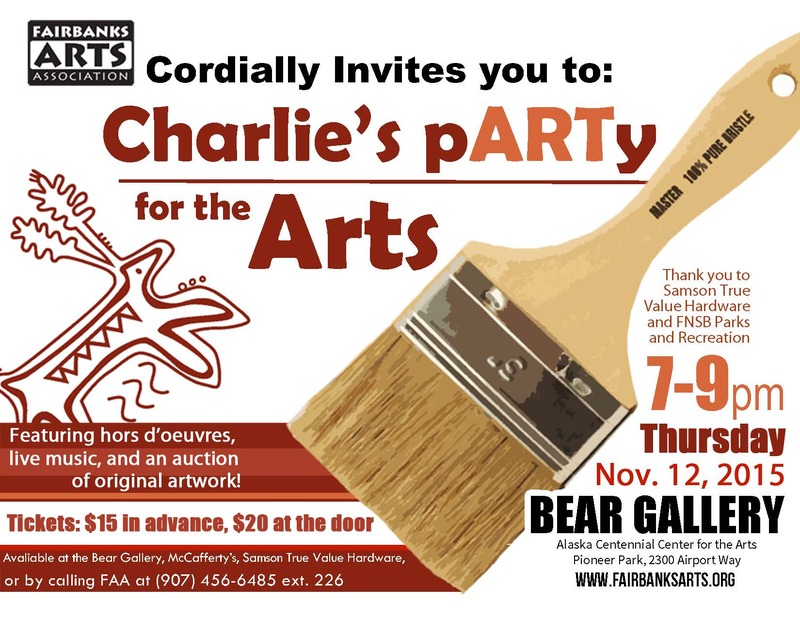 You are invited to Charlie’s pARTy for the Arts fundraiser! Twenty-five local artists were asked to create an original work of art from an item generously donated by Samson True Value Hardware for FAA’s annual Charlie’s pARTy fundraiser. This year’s special object is a paintbrush and we are excited for you to see what artists have been coming up with! Join Fairbanks Arts on Thursday, November 12 at 7 pm for this special event in the Bear Gallery and enjoy food, friends and fabulous art! Tickets are $15 in advance or $20 at the door. Be sure to get your tickets now so you can have a great time AND support the arts! All proceeds from this benefit programs of Fairbanks Arts Association.